DULUTH, Ga. - Sept. 14, 2018 - PRLog -- Marking so much more than just a fun event or a great excuse to get all dressed up, the Rainbow Village WE ARE FAMILY GALA 2018 marks the nonprofit organization's largest fundraiser of the year. Hosted from 5:30-10:30 p.m. on Saturday, October 27 at the prestigious Atlanta Athletic Club, proceeds from the Gala help change the lives of families Rainbow Village serves. Dedicated to breaking the cycles of homelessness, poverty and domestic violence in Georgia, Rainbow Village is comprised of a campus in the heart of Duluth that boasts five apartment buildings with room enough to house 30 families at a time. The onsite community center is home to an early childhood development center, learning spaces for character development classes for resident youth and life skills classes/ counseling sessions for resident adults, a chapel and a gathering space for weekly family meals and special events. "I wish I could find the right words to express my gratitude for how [Rainbow Village has] impacted my family's life; however, I don't think the words exist," Bianca, young mother of three and Rainbow Village graduate. "Every time I think of it, tears well up in my eyes. [Rainbow Village] provided us with a beautiful, spacious place to live. [They] educated me on life skills. [They] taught me to budget, to plan and to be as prepared as possible. [They] gave my children a safe place to go after school and educated them, not just on academics, but also character." During last year's Gala, Rainbow Village and its supporters raised $275,000 to help the Gwinnett County-based nonprofit meet the financial demands of providing housing and services to continue to transform the lives of homeless families. Hopes are high that even greater numbers will be achieved this year. This year's black-tie optional event will include a seated dinner, wine, games and a raffle, as well as live and silent auctions. Items featured in this year's live and silent auctions include Superbowl tickets + hotel accommodations, a week's stay at Villa on Lake Burton, Rothschild Wine, and two Roundtrip Delta Airline Tickets, just to name a few. As in year's past, a very special Family Art project – created by one or more members of the Rainbow Village family – will be auctioned off to the highest bidder. "This is my first year attending the We Are Family Gala in my new role as Rainbow Village CEO," explained Melanie Conner. "I'm excited to see it all come together. I understand from members of our staff who have been here for years that it's a truly transformative event – touching the lives of not only our Rainbow Village families, but also the lives of everyone in attendance. They say you can actually FEEL a difference being made and for me – that's everything!" 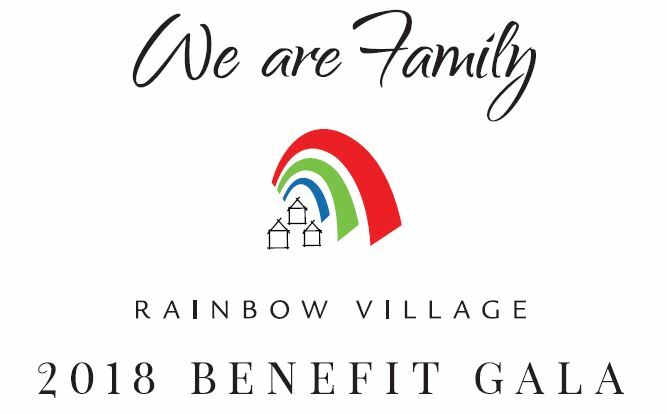 Tickets to the Rainbow Village We Are Family Gala 2018 are $175/person and can be purchased online on the Events Page at www.rainbowvillage.org (https://rainbowvillage.org/event/2018-we-are-family-benef...). About Rainbow Village: Established in 1991 and based in Duluth, Georgia, Rainbow Village is a 501(c)3 nonprofit organization devoted to breaking the cycles of homelessness, poverty and domestic violence. Committed to serving as a "community of transformation", Rainbow Village applies a holistic, two-generational approach to serving homeless families with children. With the goal of helping families achieve emotional stability and financial independence, Rainbow Village provides housing, early childhood education and after-school care, child and youth programming, financial planning, career counseling, workforce readiness, mental health counseling, community events and more. Rainbow Village accepts applications from homeless families with minor children throughout Georgia. To learn more about Rainbow Village, register as a volunteer or make a donation, visit www.rainbowvillage.org.